On this edition of Rasslin Memories, George Schire and Glen Braget welcome David Fuller to the program to discuss the upcoming IHWE Texas Pro Wrestling Hall of Fame Induction Ceremony for the class of 2014. David Fuller is owner of IHWE pro wrestling in Texas and founded the Texas Wrestling Hall of Fame in 2009, Which every year celebrates the lineage of Texas. Current Members include-Johnny Valentine, Slick, Jazz, Kamala, James Beard, Black Bart, Bruiser Brody, Matt Borne, Akbar. 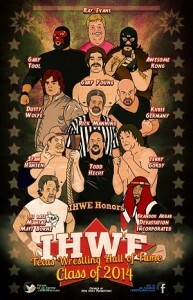 In March we will induct Terry Gordy, Stan Hansen, Gorgeous Gary Young & Others. In 2015 We will induct the Von Erich Family. Fuller is also currently director & co host of IHWE Radio, a podcast that is live every Wednesday night. He’s a member of the Cauliflower Alley Club, has done Film and is currently working on my auto biography as well.